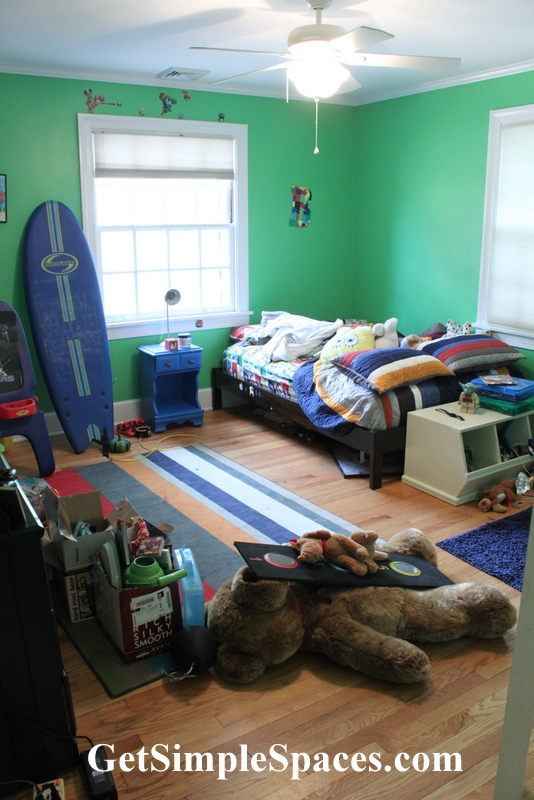 Bedrooms that belong to boys can be quite scary. Making the decision to clean and organize them is a BIG and BRAVE step on the part of any parent! The room I’m sharing on this post was a bit more challenging than the first. This child had a lot more “stuff.” I didn’t get a picture until we had already started working through the room and closets, but here’s what they looked like as things were underway. 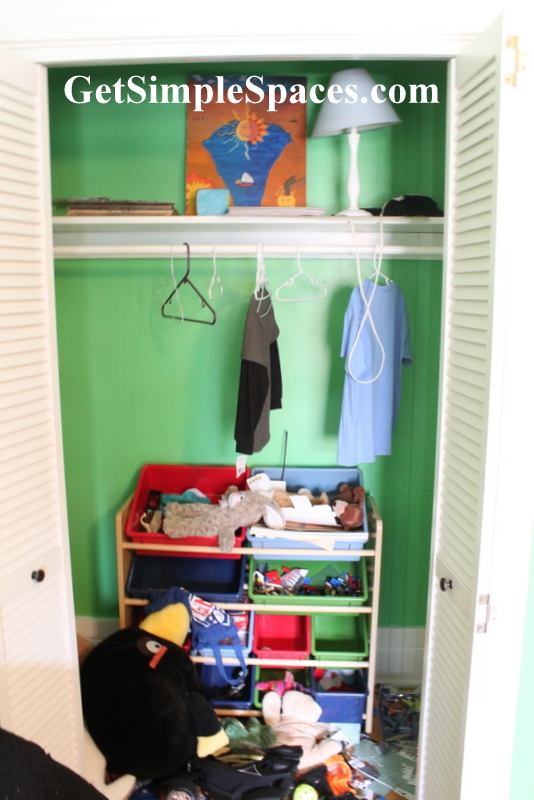 When organizing a child’s room, it’s always in their best interest to ask them to pull out the toys and items that they absolutely want to keep. Give them a limit on how much. Help them work through their thoughts and make decisions by asking questions “When is the last time you played with this? Do you still like it? If you could choose between (give them two choices) which do you like best?” The older they are, the easier this process is. But I’m sometimes surprised by the things that mean the most to my own boys. My client had already gone through the room with her boy before our work session, and we had a great start with many items already designated as donations. After this I swept through the room, sorting and putting aside things that I knew he wanted to keep, and filling up more donation boxes. When my work was done, it was time for Scott Thigpen with Solid Foundation Builders, Inc. to once again come in and work his magic. Are you ready for the reveal?! Another job well done on the loft bed and built-in desk by Solid Foundation Builders, Inc! The space underneath the bed is the perfect little retreat for a boy. The cube shelf is versatile and will change in function as he gets older. Here are some up-close shots of the desk. The closets had a complete overhaul as well. One was left with a rack for clothes that need to hang. The other was outfitted with shelving from Solid Foundation Builders, Inc. Whether your spaces need a little touch up, or a complete overhaul, don’t hesitate to call me! When your home is organized, you can focus on doing what you really love. © 2019 Professional Organizer, Home Staging | Simple Spaces|ProPhoto WordPress Blog by NetRivet, Inc.